I can still remember being a young broke college student on a mission to mix up some margaritas with friends. Just one problem: No blender. So we headed to a thrift shop and with a little bit of digging, were able to piece together a Frankenstein blender that got the job done and we only spent $1. I’m since graduated to a rather nice blender and I’ve swapped the margaritas for smoothies. But I haven’t stopped shopping for secondhand items for my kitchen. And I’ve learned that there is a right way and wrong way to do thrift shopping for your kitchen. Before you do any thrift shopping for your kitchen, it is important that you create a list of what you need. Thrift shops put you at great risk for impulse buys if you don’t shop with cash and a plan, so make a list and keep it with you always. Slow cookers. Slow cookers are the true heroes of the kitchen. Put them to work for you on busy days and you’ll save money. Secondhand slow cookers (or Crock-Pots for brand enthusiasts) are usually plentiful at thrift shops and garage sales and they hold up well over time. Look for ones with removable ceramic liners. Bread machines. If you’re looking to trim your grocery budget, baking your own bread is a great way to do it. Thrift stores almost always have a bread machine (or five!) in great condition for less than $10. Use them to make breads, breadsticks, buns, and pizza dough, and you’ll save. Glassware. If you’re in need of plates, bowls, and glasses, then look no further for bargains than your local thrift shop. You can often get whole sets of dishes for under $20. But even if you can’t find a set, remember that the coordinating-but-not-matching-look is pretty popular right now. Glass mixing and serving bowls, as well as Pyrex, can often be had at good prices, too. Serving platters. If you don’t regularly entertain, you probably don’t have a need to drop a huge amount of money on serving platters. But they are nice to have for those rare occasions when you are hosting a gathering. Look for attractive, large serving platters at thrift stores, and you won’t have to feel guilty for keeping it in the cupboard for most of the year. Cast iron pans. Cast iron pans are the true workhorses in a kitchen, and if you are lucky enough to find one in good condition at a thrift shop, be sure to pick it up. If you take care of your cast iron, it will last forever, making a great deal an even better value. Blenders and food processors. If you’re on a budget and you really want one of these gadgets, you can usually find a deal at thrift shops. Just make sure that it is really, really clean, and that it is easy to clean. And don’t hesitate to ask the clerk if you can plug it in to make sure it works. Plastic cups and containers. Plastic doesn’t always come clean, and sometimes stains and weird smells can stay with plastic cups and containers for years. Plastic also breaks down over time, which isn’t good for you or your family. If you really want plastic containers or cups, buy them new and on sale, so that you know they are BPA-free. Teflon pans and baking sheets. Teflon has a tendency to flake off pots and pans over time, which reduces their effectiveness and posses a health hazard for you. Stick to stainless steel and ceramic options instead. Seasonal Stuff. That adorable bunny-shaped serving platter seems like it would be so fun to have for Easter, but what will you do with it the rest of the year? Just because those Christmas dishes are a rock bottom price, doesn’t mean they need to be cluttering up your cabinets for 11 months out of the year. Stick with basic, year-round dishes and platters for the best value. Coffee Makers. I’m not a coffee drinker, but I’ve seen how coffee drinkers neglect their coffee makers. It’s gross. I’m not convinced there’s any amount of cleaning that can make a used coffee maker a bargain in my book. Only buy one at a thrift store if it’s brand new in the box. Coffee mugs, travel mugs, and water bottles. There is no reason to buy these secondhand. Why? Because they are often given away at conferences, community events and the like. You may have even gotten them as gifts. People give them away at garage sales. And once you have some, they multiply like bunnies in your cupboard while you sleep. 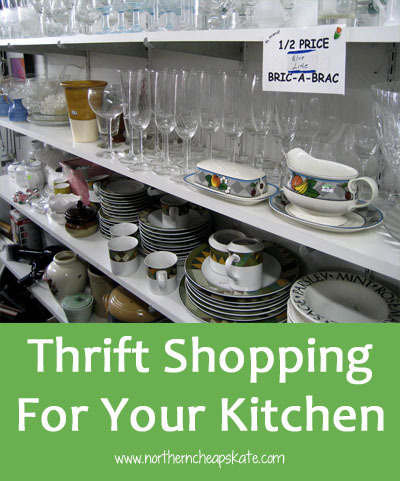 Be a smart thrift shopper for your kitchen. It doesn’t matter if you’re spending a few dollars at a thrift store or hundreds of dollars buying new at Macy’s: You need to be a smart shopper. Remember to stick to a budget, only buy what you truly need and truly love, and you will outfit your kitchen in style. Your turn: What kitchen items do you buy at thrift stores? What things won’t you buy secondhand for your ktichen? Great list. In addition to plastic, I think I’d add wood as a no-no. I would never buy a wooden cutting board, for instead, second-hand. I’ve bought silverware and pizza cutters from thrift shops before. I am planning to buy some broiler pans (the top sections with holes in them) at the next 50% off sale (my local thrift store has a bunch) and use them as a base for charcoal for a grill I am building. I have been able to build up a nice collection of pampered chef stoneware from garage sales & thrift shops getting each piece for anywhere from $1 to $12. The only reason I paid $12 for a piece was because it was the muffin pan I really wanted (normally like $40) and had obviously never been used. I also have a whole set of china (12 place settings & serveware) from thrift stores, canning jars and lots of other kitchen stuff. I love the Pampered Chef stoneware, but I much prefer the secondhand prices!